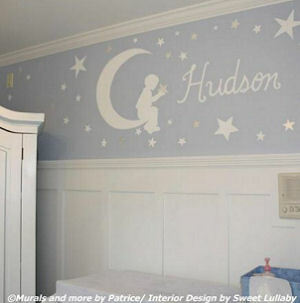 DIY or hand painted baby nursery murals are an excellent and inexpensive way to paint and personalize a baby's room. 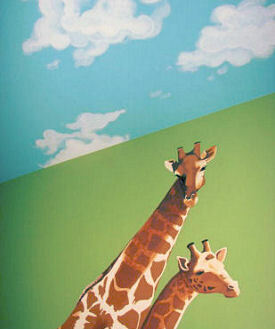 We have mural painting ideas for the nursery walls that can grow with kids and remain as an accent for several years. So what if you aren't artistically inclined. Just choose a wallpaper mural from one of the online stores or use decals to create your mural. The advantage of using stickers or decals to create a design rather than painting is that you never have to clean a brush or worry with removing paint from the floors or surrounding areas afterwards. It's a dirty job but hours of planning, preparation and cleanup have not deterred many parents from trying their hand at mural painting. As you will see their efforts have produced some pretty awesome results as you will see from the examples in our gallery of pictures. Go here to see more mural painting ideas for the walls of your kids' rooms. For those of you who find the idea of designing a full size wall mural intimidating, there are many fine artists that specialize in murals for kids' rooms that are willing to do the work for you but you must be able to tell them what type of artwork you want. Look to your own childhood for inspiration. For example, was there a book with pictures you enjoyed like Dr Seuss, Beatrix Potter or Goodnight Moon? 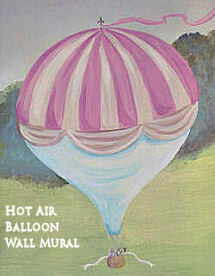 A hot air balloon mural painting of a blue sky filled with clouds and colorful balloons flying over a fairytale princess castle or an English countryside is perfect for a baby girl's room. If vintage themes aren't your taste in nursery decor; perhaps a mural featuring the skyline of your favorite city would be more to your liking? 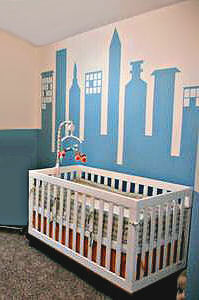 This baby boy's mom made her own city skyline mural using fabric that inspired both the room's theme and color scheme. A cloud mural gives a baby's room such a light and airy look whether they are painted on the walls or ceiling. Here are some examples of murals in various themes and styles for your consideration. Some are painted, some were created using decals and there are several that combine painted backgrounds and decals with amazing results. This painting would be suitable for many forest baby nursery themes in a baby boy's nursery as the mural has deer, ducks, geese, bunny rabbits and a little boy sitting under a tree. A ceiling mural is an excellent way to draw the eye upwards in a room with sufficient ceiling height. A collection of Disney characters in silhouette can easily be managed with the use of a projector or stencil pattern. 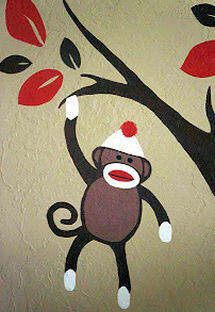 This colorful sock monkey wall mural would be an easy painting project even for a beginner. Did you paint a mural on the baby's nursery wall? Our visitors would love to see it! Make a scrapbook of pictures of kids murals that you have seen in books that you might want to incorporate into your nursery decor and send them to your baby nursery mural designer. This will help to let them know how to paint a tree mural, cloud mural or whatever type of mural that will work in your room. It's hard to give instructions for exactly what look you are trying to achieve, but please try. Take care to choose a theme that will easily make the transition from baby to toddler to get the most use of your baby nursery mural value. Decorating an entire bedroom over and over can be expensive, so consider your decorating ideas for the future! This is really easy (and cheap!) to do if you think about how you can use your first baby nursery mural as a basic foundation and then accessorize it. 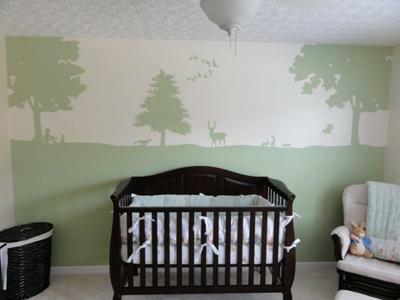 For instance get a wall paper mural that features a view of the countryside and use decals for characters in your baby nursery mural to bring your theme into play. When baby is older, you can get stickers for an older kids mural. If you have a sports themed room, get a basketball wallpaper mural or whichever sport you want! Get a discarded locker and paint it in bold colors to match your wall murals for added storage. For a baby girl's pink French poodle theme bedroom, pictures of the Eiffel tower would make an excellent backdrop from toddler to tween! What a sophisticated baby nursery mural a Parisian skyline would make! Children's wall murals can be adapted for room themes that your kid might want for their bedroom in the future! 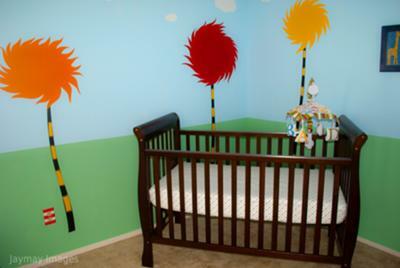 If you feel that your talents with a brush will not cover detail painting, why not paint your desired background and then use some large decals to complete your nursery wall decor? Another way to make the painting go faster is to use wall stencils rather than attempting to draw and then paint the images on the wall free-hand. A full wall mural is a a great way to make a child's room come alive. So what are you waiting for? Before you get started, I would like to invite you to visit our gallery of nursery pictures to see many amazing wall art projects painted by parents who visit our website.